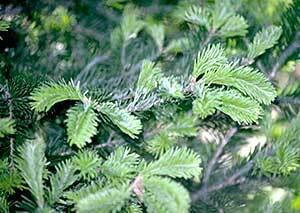 Most firs (Abies), especially balsam and Fraser firs, in the Northeast. 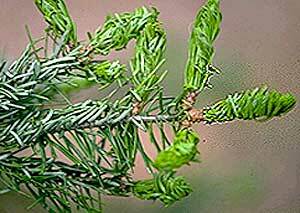 It is a pest in both the Christmas tree plantation and the landscape. 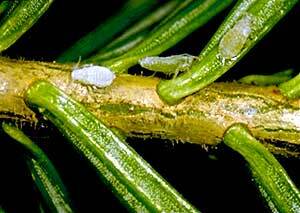 Balsam fir (Abies balsamea L.) is the most commonly grown Christmas tree in New England and serves as the primary host to the balsam twig aphid (BTA). In the spring, the piercing-sucking feeding activity of this pest causes the newly emerging needles to become twisted and the copious amount of honeydew produced causes the new shoots to stick together. 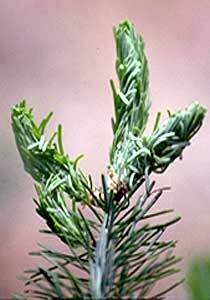 Injury from this pest will persist on the tree for two to three years and heavy attack during harvest years will render Christmas trees unfit for sale, despite the injury being only aesthetic. 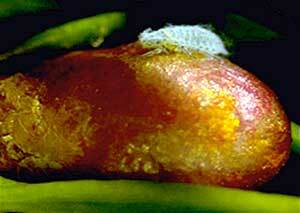 Over-wintering eggs of the BTA are found in bark crevices. 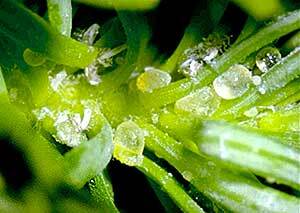 The eggs will hatch prior to budbreak and then quickly pass through all life stages to be adult, wingless females known as stem mothers. These will begin to produce live young just at budbreak and heavy feeding will begin. It is this stage that causes the most injury to the host plant. These immatures then mature into winged adults and may disperse to other plants. 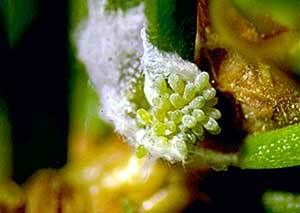 Eggs will be laid in bark crevices and fine white waxy strands may be observed to be associated with these eggs. All feeding usually ceases by early to mid-June in southern New England. Once population sizes of economic importance have been established, it is then necessary to apply effective management measures. In recent years, the use of various insecticidal compounds have displayed a wide range of management results; some of which are unacceptable to the grower. Contact pesticides, such as horticultural oils and insecticidal soaps usually do not result in acceptable management levels given the inability of the compounds to come into contact with the insect. Therefore, chemical pesticides are often required. 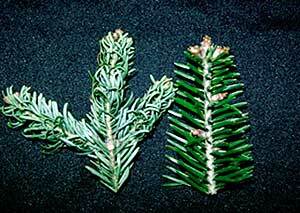 The use of systemic pesticides may be too cost prohibitive in the Christmas tree plantation.